Complete driving instructions from Richland, Washington, the Portland Airport, and all points into the city can be obtained by clicking on the link above. See a simple map of the downtown area near the PNNL Portland Office, including nearby parking garages. It is a short drive from the airport to downtown Portland, or you can travel by light rail train which runs every 15 minutes. The train stops just 1/2 block away from the Portland Office. From there, it is just a few short steps to our front door. Get off the train. 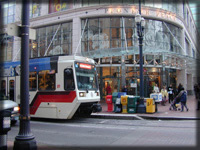 The light rail train stops at Pioneer Place, a large shopping mall. The conductor will announce the stop, so listen closely! Cross the Street. Cross the street in front of the light rail train. Across the street is the NIKE store. Find the Fat Cat. 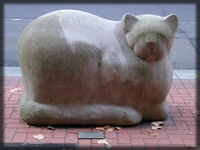 About midway down the block is a statue of a fat cat. Directly opposite the cat is our front door. Our Front Door. 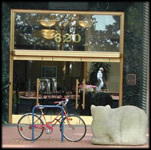 Here is the main entrance of the 620 building (see the fat cat?). The Portland Office is in Suite 810, 620 SW 5th Ave. The Portland Office is located in the heart of Portland and is surrounded by many hotels at per diem rates. For more lodging choices, please visit the Portland Oregon Visitors Association website. Portland, "The City of Roses," has plenty of attractions to tempt the visitor. For more information on events, places to visit, restaurants, and shopping, explore the Portland Oregon Visitors Association website. We're conveniently located in the heart of downtown Portland, Oregon within walking distance of shops, restaurants, hotels, and more.